ROTJ hardcopies and hardcopy parts surface more frequently than their than Star Wars and Empire Strikes Back era counterparts, however they are still exceedingly rare in the grand scheme of things. 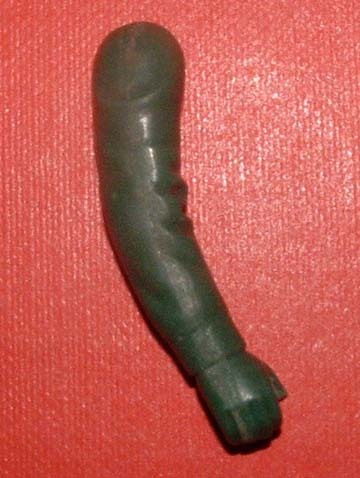 The green B-wing Pilot hardcopy arm seen here is cast in dynacast, a urethane commonly found among Kenner hardcopies from the Return of the Jedi and sometimes Empire Strikes Back eras. The hardcopy parts are slightly larger than that of the production figure's when placed side by side. This size difference holds true for the other figure parts, which are sadly absent. 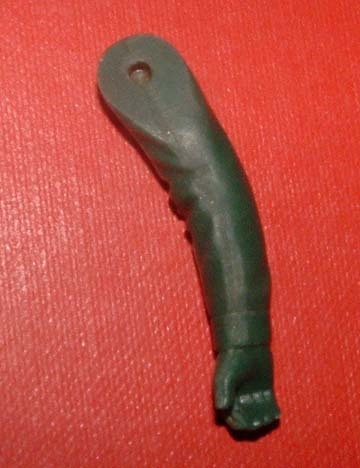 The second photo shows the depressed area in the arm, which serves to affix the limb to a hardcopy torso.